Felda Global Ventures Holdings Berhad (FGV) spearheads the Felda Group’s business transformation into an integrated multinational corporation, focusing on the agri-business sector. FGV is investing in diverse activities such as multi-crop plantations, oils & fats, oleochemicals, logistics and services throughout the world. With operations, in more than 10 countries including USA, Canada, China, Australia and the Middle East, Felda Global aims to extend its reach by undertaking investments, acquisitions and strategic collaborations across the upstream and downstream value chain. We are principally involved in plantations, downstream and sugar businesses. Incorporated in Malaysia as a private limited company in 2007, Felda Global Ventures Holdings Sdn Bhd (FGV) initially operated as the commercial arm of Federal Land Development Authority (FELDA). On 28 June 2012, the company was listed on the main market of Bursa Malaysia Securities Berhad as Felda Global Ventures Holdings Berhad. 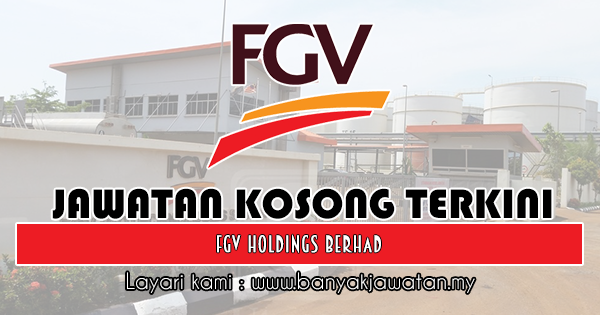 0 Response to "Jawatan Kosong di FGV Holdings Berhad - 28 Mac 2019"